The Enrei variety was born in Japan, in the Kikyoukebara plateau region in the central part of Nagano prefecture (home of the 1998 Winter Olympics). This area, largely wild until the Meiji Era, was transformed throughout the late 19th and early 20th centuries into one of Japan’s leading fruit and wine producing areas. It was here that plant researcher Kimito Mikoshiba worked with a team of three others for 19 years to perfect the Enrei variety. 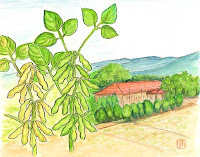 Mikoshiba began his research in 1957 at the Nagano Agriculture Experiment Station; the goal was to create a variety suited to the high central part of Japan, which at that time lagged behind other areas in soybean production. In a plot of several small fields surrounded by white birch trees on a high, sunny plateau, the four men brought two packed meals a day, eating lunch and dinner in the fields, observing the soybeans, and discussing their crop until past midnight nearly every night. In 1961, the Japanese soybean market was liberalized, opening the way for massive imports from the U.S. and a sharp decrease in domestic production. Over the ensuing years, self-sufficiency in soybean production dropped from around 28% to less than 5%. Considering the soybean’s role in Japanese food culture--edamame, soy sauce, tofu, natto, and miso bean paste--this could be seen as a cultural crisis. Imagine if the U.S. only produced 5% of the corn it consumes! Despite these pressures, Mikoshiba and his team did not give up and continued their research. The mid to late 1960s was also a time when advances were being made in the areas of photosynthesis research and high yield variety development; this background contributed to the characteristics of Enrei. Beginning in the late 1960s, the soybean began to enjoy a renaissance as it was recognized worldwide as an excellent source of vegetable protein. Tofu and other soy-based foods became popular health foods in the West, while in Japan it was also seen as an alternative to rice production. The Enrei variety was finally introduced to the world in 1971. It soon became a popular variety in Japan, and the cultivated area grew quickly; Enrei became the number 1 soybean in Japan from 1981 to 1990. Currently, it accounts for around 40,000 acres of cultivation. It has a wide adaptability, which is rare in a soybean, and does well even when densely cultivated. It even seems to be doing well in the Missouri Ozarks! The name “Enrei” comes from 2 places: one, the Enryou Pass near where the bean was created, and two, the Japanese word “enrei,” which means “charming, enchanting, captivating, brilliant.” This is said to refer to the glossy luster of the mature bean. After Mikoshiba resigned as chief of the research station, he farmed in his hometown, where he was often seen with his snow-white hair poking out of a distinctive black beret. He died in 1999 at the age of 71, leaving behind one of the great Japanese soybeans. Because of its high protein content, Enrei can be enjoyed as edamame (green) or used as a fully mature soybean in miso, boiled beans, and tofu. Eaten as edamame, it has a creamy, almost buttery, flavor, while the sweetness of the mature bean is perfect for tofu. The presence of soy isofavone and a good balance of nutrients (particularly glucose and protein) make it an ideal part of a healthy diet. Enrei soybeans have an abundance of vitamins B & E, and are said to be good for fair skin, poor circulation, and shoulder stiffness. We hope you enjoy the edamame—savoring a flavor that took 19 years to create… and 3 and a half more months here in the Ozarks!